The FLEXMAP 3D® is Luminex’s most advanced and versatile multiplexing platform. Fast read time, compatibility with both 96- and 384-well plates, and ease of integration with front-end automation systems make the FLEXMAP 3D the platform of choice for high throughput applications. The platform uses both magnetic and non-magnetic microspheres and is capable of simultaneously measuring up to 500 genes or proteins from a small sample. Automated start up, shut down, and maintenance routines make the FLEXMAP 3D easy to use and maintain. Higher Throughput: Dual sample fluidics paths and increased sample injection speed result in a faster sampling rate. The FLEXMAP 3D system can process 384 samples and generate up to 144,000 data points in just over an hour. High Plexing Capability: The FLEXMAP 3D is compatible with magnetic and non-magnetic microspheres and can discriminate up to 500 different microsphere sets. The platform offers a large menu of commercial kits and reagents to develop custom assays for a wide variety of applications including nucleic acid assays, immunoassays, receptor ligand assays, and enzymatic assays. Automation/LIS Compatibility: xPONENT® Software controls the FLEXMAP 3D system and offers interfacing options for Laboratory Information Systems (LIS) and front-end automation platforms. The system accommodates 96 and 384-well plate formats for enhanced sample flexibility and increased throughput. Reliability: The FLEXMAP 3D system has multiple features allowing walk away start-up, shutdown, and maintenance operations, and greatly enhances usability for High Throughput Screening (HTS) applications. All Luminex instrumentation is marked in compliance with electrical/safety device standards for appropriate regions. For details on approvals and standards compliance please contact Luminex. Installation Qualification (IQ) and Operational Qualification (OQ) services are performed by Luminex Field Service Engineers, and are critical to ensuring that your instrument is properly installed and operating according to specifications. For more information, please click here, contact your Luminex representative, or email [email protected]. The FLEXMAP 3D® instrument requires sheath fluid to serve as the delivery medium to transport the sample to the instrument’s optics. This instrument has the option of a 20 L disposable external sheath fluid container or a compact 20X sheath fluid concentrate pack; which can be reconstituted to a 20 L working concentration. Apart from the significantly reduced storage space required, the concentrate pack can save the user considerable shipping costs; upwards of 80% savings, in some cases. All xMAP® instruments requires regular calibration and performance verification testing, to ensure the system is operating correctly and to maintain data accuracy. The FLEXMAP 3D instrument is calibrated using a calibration and a verification kit, each providing 25 uses. 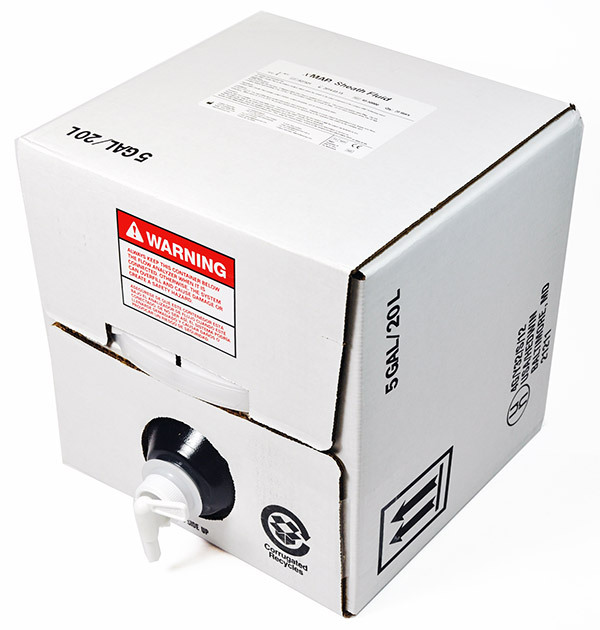 Sheath Fluid (20 L) has a two year shelf life from the date of manufacture, and Luminex guarantees a shelf life of no less than six months from the shipment date. Sheath Concentrate Pack (1 L) has a nine month shelf life from the date of manufacture, and a guaranteed three month minimum shelf life. Calibration and Verification reagents all have a two year shelf life and a guaranteed six month minimum shelf life from the shipment date. All Sheath Fluid, Calibration, and Verification reagents ship within three business days via ground carrier. However, please note that backordered items may have longer than normal lead times. Click here to review the entire Reagent Shipping Policy. The FLEXMAP 3D system is a class 1(I) laser product. If using these products for clinical diagnostic applications, ordering the IVD part number will provide reagents with appropriate In Vitro Diagnostic labeling. Note: For In Vitro Diagnostic Use. Products are region specific and may not be approved in some countries/regions. Please contact Luminex at [email protected] to obtain the appropriate product information for your country of residence.